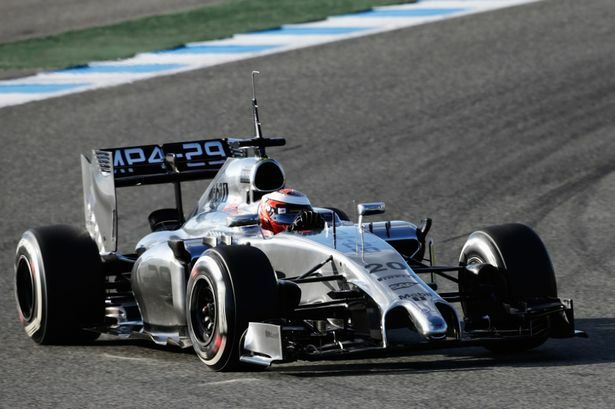 McLaren rookie Kevin Magnussen was the fastest man today as pre-season testing continued in Jerez. The Dane set 52 laps throughout the day, setting more laps than team-mate Button did on Wednesday, and beating his time which was set while testing Pirelli’s wet tyres. But the focus was very much on Red Bull whose week failed to improve, leaving Daniel Ricciardo going up in smoke on his first lap out of the pits. The Aussie was no sooner out of the pitlane than his RB10 started smoking. It was costly for Red Bull who, after bringing the car back and fixing it up, managed only a further three laps. This brings their testing total to 11 over the three days. Nico Rosberg, in comparison, set 97 laps yesterday. Ricciardo later admitted that Adrian Newey had gone back to the drawing board in an effort to make the RB10 more stable. It’s no reason to be anxious about the reliability of the car, however, as knocking out the kinks is the purpose of pre-season testing. Felipe Massa was the second fastest man, running 47 laps for Williams and recording a 1.23.700. His best lap time exceeds that set by his Finnish team-mate, with Williams looking particularly strong in the hands of Massa and Bottas. Lewis Hamilton was third for Mercedes and eager to make up time lost after his early shunt on Tuesday, which was caused by a front wing jamming itself under his car and disabling both the steering and the brakes. His former McLaren team-mate, Jenson Button, was next down the order for the British team, clocking up 40 laps with a best time of 1.25.030 after he took the MP4-29 on track for the afternoon session. Fernando Alonso was fifth for Ferrari, four-tenths of a second shy of Button’s fastest lap. Alonso’s 58 laps were not without issue, however, as his Ferrari ground to a halt around the track during the morning session. Nico Hulkenberg was in control of the VJM-07 today, but set a mere 17 laps. Jean-Eric Vergne had an average run – his 30 laps producing a best lap time of 1.29.915, some nine and a half seconds off the pace of Magnussen. Adrian Sutil was on his 35th lap for Sauber before spinning out of control, hitting a barrier and knocking the front of his car clean off. It was a premature end to the day that the team did not want. Robin Frijns, Max Chilton and Daniel Ricciardo were all left without a time, despite running 10, 5 and 3 laps respectively. Chilton was finally on track for Marussia, who missed the first two days, but their running was hampered by consistent technical issue. The only team yet to grace the track is Lotus who announced that they would skip the test to focus on the car’s development. Testing continues tomorrow for a fourth and final day in Jerez. Doctors in Grenoble have begun the process of waking Michael Schumacher from his coma, French newspaper L’Equip claims. The 45-year-old has been in a medically induced come for a month after suffering serious head trauma in a skiing incident at the Meribel resort in France. He was put in the coma to reduce stress on the brain and help his chances of making a full recovery. L’Equip says doctors began the process of taking him out of the coma earlier this week, and he is so far responding positively. Once Schumacher has been taken out of the coma, doctors will begin to make contact with him, hoping to prompt simple responses from him – such as opening and closing his eyes or clenching a fist. However, fear still remains that the seven times World Champion could remain in a permanent vegetative state, even if the awakening is successful. Schumacher’s agent, Sabhine Kehm, told reporters that any rumours about Schumacher being in a vegetative state was nothing more speculation. “I insist again on the fact that any statement on the health of Michael Schumacher that does not come from the medical team in charge or his management is just speculation,” She told media outside the University of Grenoble hospital today. Schumacher’s family have maintained a bedside vigil since the accident on December 29th. Jenson Button led the way on the second day of pre-season testing in Jerez today. Pirelli opted to take advantage of the overnight rain and moved their wet tyre test to today, sending a tractor and tanker out on track to sprinkle water on the surface. All teams except Toro Rosso and Caterham took to the track to test the wet compounds before the lunchtime break – as the afternoon session reverted to dry running. Jenson Button, known for his excellence in wet conditions, took to the track almost immediately in order to make up the lost time that McLaren suffered due to mechanical issues on Tuesday. Button had a near flawless run and ended the day with a best lap time of 1.24.164, three seconds faster than Kimi Raikkonen’s timesheet-topping time on Tuesday. Raikkonen was second down the order, seven tenths of a second behind Button’s best lap. Raikkonen too had a straight forward day with a brief trip across the gravel the only extracurricular activity for the Finn. Fernando Alonso will take the reigns of the prancing horse tomorrow. Valtteri Bottas was third overall for Williams, recording a 1.25.344 best lap time. His 35 lap day went smoothly and the Finn raved about the FW36 – all good in the Williams camp, then. Nico Rosberg and Mercedes were also trying to make up for lost running following Hamilton’s crash on Tuesday, and completed a full race simulation. 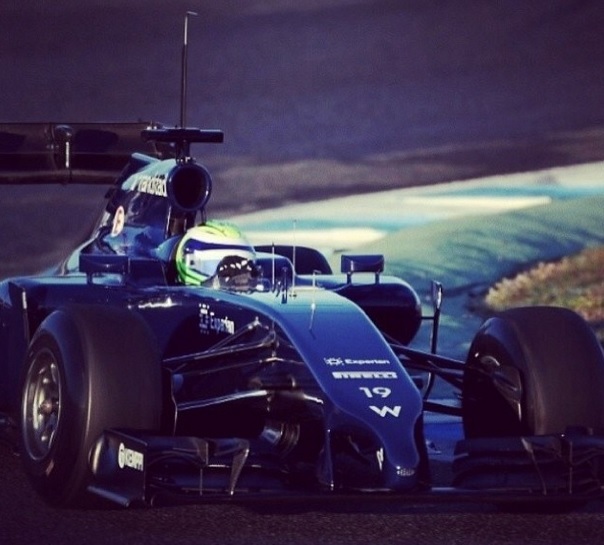 In total, he had a best lap of 1.25.588, which was two tenths slower than that of the Williams. Sergio Perez was fifth for his new team, completing an average 37 laps and securing a time of 1.28.376 – some two tenths shy of Rosberg. Esteban Gutierrez set 53 laps, his running curtailed when he tried to run with the slicks on the wet track and slid into the gravel. Luckily he stopped just shy of the gravel but time was cost retrieving the car and analysing the C33. Marcus Ericsson was back in the car for Caterham today, the Swede completely a mere 11 laps in the Renault power car. His CT-03 ground to a halt in the pitlane when he left his garage this morning as Renault were blighted with issues. He eventually got back out on track for some laps, albeit a short run, during which he set a 1.37.975 best time. Sebastian Vettel had another poor day in Jerez, his Renault powered car also suffering problems. He completed three laps on Tuesday and a further eight laps today but was eventually forced to call it a day when his Energy recovery Systems faulted. Red Bull’s chief technical officer, Adrian Newey, has warned that the new mandatory low nose cones could cause cars to ‘submarine’ in a crash. In an attempt to stop cars being launched into the air in crashes, the 2014 regulations state that tip of a car’s nose cone must no higher than 185mm, as opposed to 550mm which the previous regulations allowed. Airborne crashes are the final frontier for those trying to make F1 safer, with crashes like Mark Webber’s airborne adventure in Valencia 2010 or the pile-up in Belgium in 2012 all caused by cars mounting other cars. However, Adrian Newey has warned that the opposite could occur in a crash, and cars could be forced down – potentially prompting a more dangerous situation. “The regulation has been introduced following some research by the FIA which suggests that nose height reduces the chances of cars being launched,” Newey told reporters in Jerez, where the first of three pre-season tests are ongoing. “So the accident that Mark had when he hit the back of Kovalainen in Valencia a few years ago. I must admit I am concerned that the opposite may now happen, that cars submarine effectively. So if you hit the back of the car square-on, you go underneath it and you end up with the rear crash structure in your face which I think is a much worse scenario. “And there have been some accidents where you think if a low nose would have possibly made things much worse? There was the accident a couple of years ago where Schumacher spun at the first corner and somebody mounted him – with a low nose that might that have made that worse. Aside from the job that the new noses are supposed to do, much has been made by the aesthetics of the new rule. With most teams opting to put a pole sticking down from the main nose cone instead of affecting aerodynamics by putting the entire nose cone close to the ground, the finished product looks like a cucumber hanging from the car. Ferrari’s Kimi Raikkonen has topped the timesheets at the Circuit de Jerez, where the first of three pre-season tests today kicked off. The Ferrari returnee set the most laps, almost double that of Lewis Hamilton who set 18 laps. Raikkonen completed 31 laps of the Spanish circuit in total, finishing the day with a best lap time of 1.27.104 – roughly seven tenths faster than Hamilton. Kimi’s first innstallation lap ended after five corners when the Ferrari pulled over. The team called this a precautionary stop and he later got back on track. Lewis and Mercedes were the first team out on track but were forced to call it a day prematurely when the front wing on his Mercedes failed and lodged itself under his MGP-05, sending him into barriers at the end of the straight. He crashed in the same place, also on the first day, in 2013 when his brakes failed. Valtteri Bottas was the third name down the timesheets, completing a mere seven laps which resulted in a best lap time of 1.30.082 – nearly three seconds shy of the time set by Raikkonen. Sergio Perez was fourth for Force India, completing eleven laps and finishing the day six seconds behind the Ferrari. Jean-Eric Vergne was nine seconds shy of Kimi, having run fifteen laps of Jerez in total. His day also ended early when the STR9 developed problems. Esteban Gutierrez in the Sauber was the last man to set a lap time, fifteen seconds off the pace after seven laps. Sebastian Vettel and Marcus Ericsson were seventh and eighth respectively. Vettel completed a total of three installation laps. Rookie Ericsson got the Caterham out on track for one lap, after the team delayed the launch of the car due to technical issues. McLaren was at Jerez but didn’t run due to electronic issues on the car. Marussia were not in Jerez, and will not be tomorrow, as they developed some issues before leaving their factory and opted to stay in Britain until the problems were rectified. Pre-season testing, and the first days in particular, is when teams start to get a foothold on if they’ve concocted the right formula or made a mess of their 2014 cars. Running continues tomorrow and will run until Friday before F1 goes to Bahrain for the remaining two weeks of testing.